How I Got this Book: Free from the publisher. Why I Read this Book: The paranormal/historical romance combination sounded very interesting! 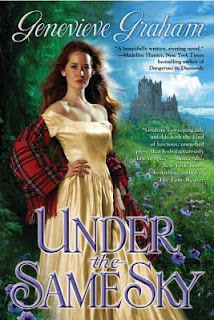 I've always loved historical romances, so when this one popped up in my e-mail I was delighted! The back of the book and the cover reminded me of a light, fluffy romance with a paranormal twist (like a Lynn Kurland book.) I was excited about the idea of telepathic communication across the world, between two characters who have never actually met each other. During tough times they appeared to one other to help, either delivering advice or actual strength. As they got older, their ability to communicate grew stronger and they began to fall in love. The romance was incredibly sweet. They were childhood sweethearts, who were there for each other all the time, even though they were on completely different continents. I love this idea. While I did like it, this book is far from the light, fluffy romance I was expecting. The cover is quite deceptive, as this book is a rather heavy and sometimes dark read. This time period was a pretty awful time, especially for women, and the author does not sugar coat it, which I respected. At the very beginning of the book, Maggie witnesses the death and/or murders of several family members. She and her sisters are abducted by men hoping to sell them, and are beaten and raped to within an inch of their lives. Andrew goes to war in Scotland, and also experiences a lot of death and heartache. This is all described in great detail, and it actually upset me so much that I thought I would not be able to continue. I was so curious to see how things ended, though, that I decided to continue on with it. To all the tender hearts out there, if you can make it to page 115, you are going to be just fine. The book does lighten up, and it even gets suspenseful and exciting! A tribe of Cherokee Indians rescues Maggie and her sister from their captors, and takes them in as part of their family. I loved this entire protective and loving group of people. I have not had the opportunity to read much about the Native Americans, except for my history books in school. I learned so much about the culture and belief system of these Indians, and was captivated by their story and strong, almost religious, ties to Mother Nature. Genevieve's writing style is gorgeous. Her word choice stirred the same emotions in me that her characters felt. She sent me to the woods where Maggie was held captive, to the battle fields of Scotland, to the rolling hills of the Scottish Highlands, and to the deep southern colonies of North America. The dreams Maggie and Andrew had about each other were mystical and magical. Everything seemed so real to me, and I was completely captivated, even though parts of this book really upset and disturbed me. I would definitely recommend this book to lovers of historical romances with a bit of a paranormal twist. Yes, it's heavy and dark in places. Yes, I had a hard time convincing myself to finish it at one point, but I am so glad I did. You can't fault the author for retelling history. This all really happened, and I was amazed reading what people are willing to do to each other. The story is magical and romantic, and I really loved reading about Maggie and Andrew's journey to find one another. We are left with no loose ends, and you'll be very happy with how things turn out in the end. I almost skipped right over this post because of the cover image... but I started skimming, then I became intrigued, and now I want to read it. What a shame about the cover though! Same with me! The cover suggests a cheap, cheesy romance, but it doesn't sound like that at all. Realistic historical setting and paranormal romance? What's not to love? Thank you both, ladies! I don't think many readers know that authors have no say on their covers when it comes to a big publishing house like Penguin. They are the experts when it comes to marketing, and since Berkley Sensation specializes in romance, they knew a cover like that would attract the eyes of romance readers. I had pretty major concerns (and an extremely different cover in mind), but in the end the reaction has been more favourable than not - though I guess I won't hear from a lot of readers who will get turned off and ignore the storyline. This experience has definitely changed the way I buy books. I really appreciate the chance to introduce you both to the book! Should be available everywhere in North America as well as on Amazon, etc. Hope you find it! Definitely intrigued by this book now! Thanks for the great review! Thanks for coming by, Genevieve! awwww, sounds like a wonderful read. I'll have to check this out in the future! :D Thanks for reading this and reviewing this.